We are now the proud owner of chickens! Five to be exact. All various hybrids. Love them very much. They all have different personalities. Dolly and Dotty (the brown hens) are Light Sussex and Rhode Island Red crosses. Dotty is very curious about everything and likes to climb on my lap. Dolly likes to come and see what I'm doing when I'm cleaning out their coop. 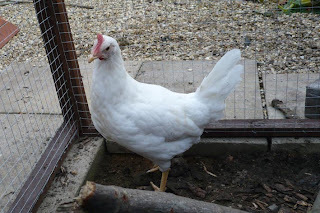 Sybil (white hen) is a Leghorn cross and will lay white eggs (eventually!). She's very scatty, but incredibly comical! She loves pecking at my clothes and tugging at my jeans and takes the liberty of wiping her beak on me when she feels it needs it. 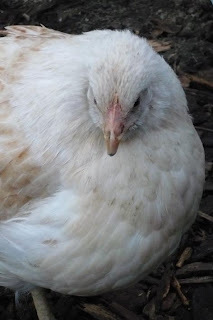 Gracie (grey hen) is a Maran cross and will lay eggs with a plum blush. She's a big hen with lovely hazel eyes. If a bird flies over she practically spins on the spot with panic! She's usually the first to go to bed. Lettuce is the last, but not least of the hens. She loves a cuddle! She's the youngest of them all but is the boss! She loves to study my face and nibble my hair. I'm wary of too much curiosity, as last week she pecked out one of my contact lenses!! For a moment I thought she'd damaged my eye and turned my head to look at her and there she sat on my lap with my contact lense sticking out of her beak! Suffice to say, I grabbed it back as quickly as possible. Keeping hens is certainly not uneventful. Well, fingers crossed for eggs. I sometimes forget they will at some point be laying them. The camera will be out when the first one appears!